What do members of the Beach Boys, Badfinger and the Bangles, as well as actors Henry Winkler, Sir Ben Kingsley and Jon Voight have in common? All are among the endless parade of notable personalities who share fascinating tales relating to the Fab Four on the forthcoming documentary Beatles Stories (the Julukesy Films release is set for release on July 7 in honor of Ringo Starr’s 72nd birthday). Los Angeles-based filmmaker/author/singer-songwriter/Beatles fan Seth Swirsky set out in 2005 to document personal reflections from famous and not-so-famous personalities on both sides of the Atlantic to recount a wealth of stories ranging from revealing events that played out when the members of the band were teens just starting out in Liverpool to seminal events that played out during the height of Beatlemania and incidents involving John, Paul, George and Ringo following the breakup of the group. Brian Wilson, Susanna Hoffs, Justin Hayward, Art Garfunkel, Graham Nash and Denny Laine (of Moody Blues and Paul McCartney & Wings fame) provide some of the most emotional insights during the wonderful film. It is bittersweet to see recently-lost names such as Monkees singer Davy Jones, Andrew Gold, one-time Capitol Records president Alan Livingston and Norman “Hurricane” Smith featured in some of their last interviews, but that sobering feeling of loss enhances the importance of Swirsky’s powerful and poignant film. Beatles Stories is a must-see for fans of rock’s greatest band, as well as anyone who loves classic rock ‘n’ roll and popular music. 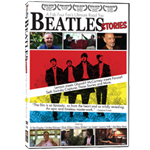 In addition to the Beatles Stories documentary itself (which was an official selection at the Newport Beach International Film Festival in 2011 and will now be available for the first time on both DVD or Blu-ray), the release has many bonus materials including more than a dozen additional interviews (including with famed Grammy Award-winning Wings guitarist Laurence Juber), a commentary track by Swirsky and a short feature on the aforementioned Normal “Hurricane” Smith, the Beatles’ long-time recording engineer who worked with producer Sir George Martin on the majority of Beatles recordings in the 1960s.